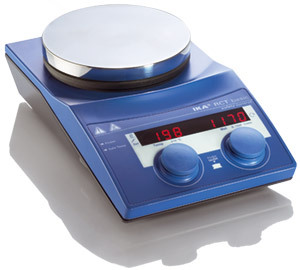 Although we have sold IKA products in the past, it is probably easier and much less expensive if you purchase these items through your regular laboratory supply company or directly from IKA. And while we like the IKA product line, there is no reason that the SynthArray equipment won't work just as well with other manufacturer's equipment. Also, because of the varied power requirements around the world, we no longer sell IKA equipment to customers outside of the US. The primary reason that we have supplied the IKA products in the past is that it has not been easy for people to find the IKA accessories, especially the short probe, although Aldrich has been selling it for years. Still does. Also, IKA's prices to us (a very small reseller) have recently gone up substantially. So to help you find these products more easily from IKA or elsewhere, we provide this guide. IKA ETS-D5 fuzzy logic control $473.00 3378000 part of SA20050 Replace the long probe with the extension cable and the short probe. IKA H60 Short temp. sensor 60 mm for the ETS-D5 $165.00 2735300 SA20060, part of SA20050 Not on the web site or in catalogs. You must insist that it exists. Also in the Aldrich catalog (part# Z404810, $132.70). We have a few in stock. IKA H70 Extension cable 1.0M for ETS-D5 $120.00 2735600 SA20070, part of SA20050 Also in the Aldrich catalog (part# Z403555, $87.20). IKA H 16 V Support rod $91.00 1545100 part of SA20050 For controller and probe.